When your customers call you outside of your standard working hours you still want them to be able to hear some useful information, even if it's just a brief audio message explaining you're closed. 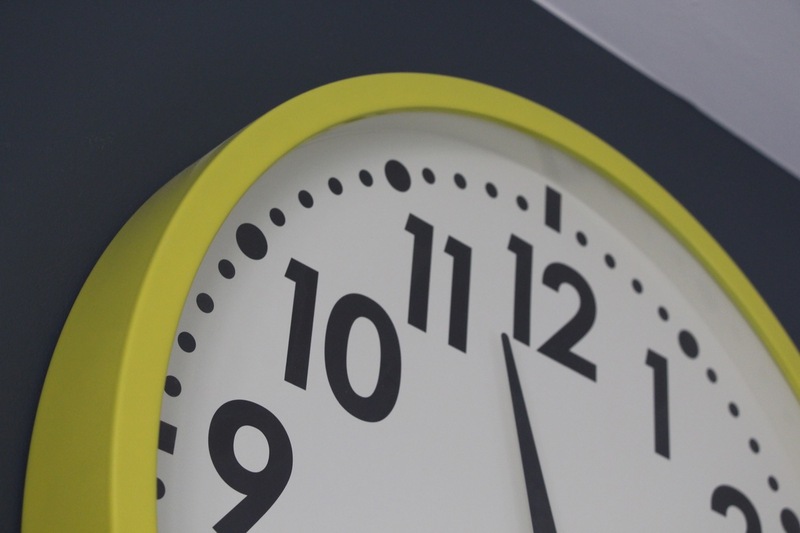 In this post, we're going to explore one of Dial 9's most useful features - Time-based routing - and how it can help you with just that. We'll look at one of the most common uses of Time-based routing today; diverting calls to a voicemail box out of hours. To start, you'll need to set up a voicemail box. Just head to Voicemail Boxes within Extensions, then click Create a new voicemail box. Enter a meaningful name and easy to remember number for it, then enter an email address to receive notifications when a new message is left and click Save to finish. Once you've saved the voicemail box you'll be taken to edit further configuration. Within Mailbox Settings -> Advanced options, you can choose a greeting if you have previously uploaded a message to Dial 9 and uncheck the option to Play Instructions, or leave both options as they are if you wish for us to play the default instructions to the caller. 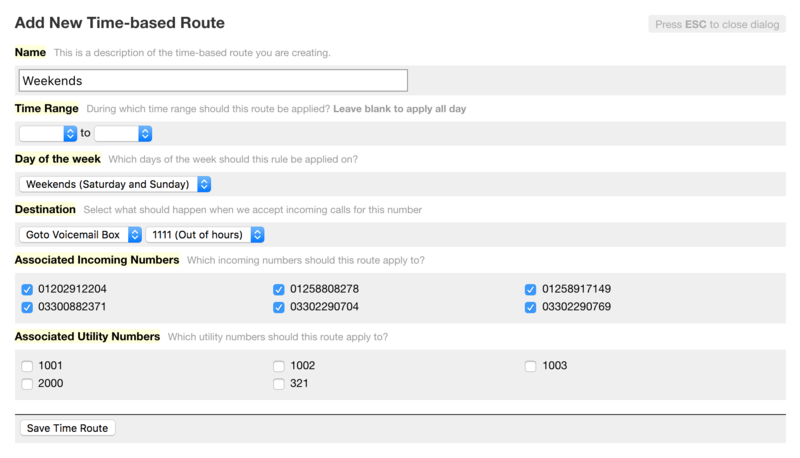 Next you'll need to head to Time-based Routing, then click Add New Time Route. We'll set up simple route to start at 5:30pm, then stop at 9:00am for our weekday calls during the evenings and overnight. Choose 17:30 in the first dropdown for the Time Range, then 09:00 in the second. 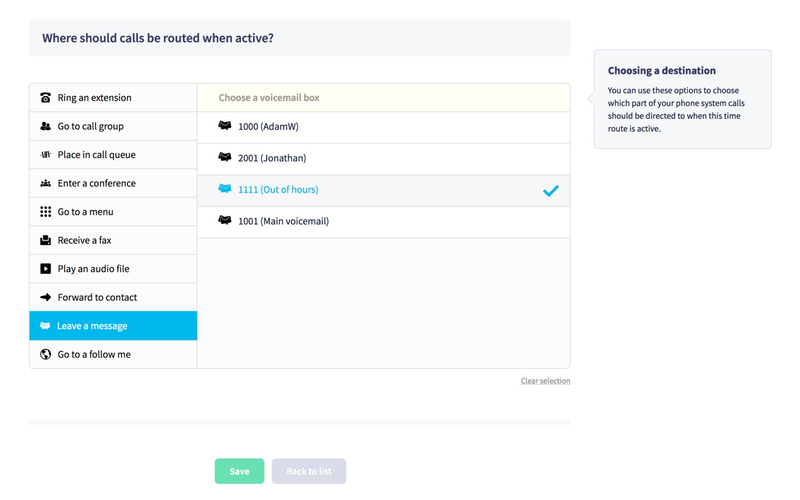 Next, choose Weekdays within Day of the week, then choose the Destination type as Goto Voicemail in the first dropdown and the voicemail box name in destination. Finally, check any Associated Incoming Numbers you want the route to apply to, then click Save Time Route to finish. 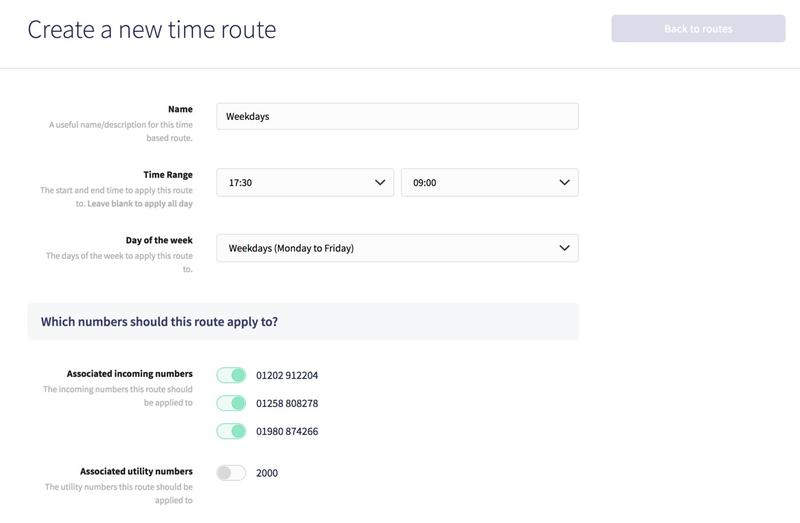 The configuration is virtually the same as the previous route, except we need to leave the Time Range blank to apply the route to all day, then choose Weekends for Day of the week. Select the same destination as before, and check the numbers to run the route for. That's it! Now all calls made outside of your working hours will reach your voicemail box. For any questions about Time-based routing or any other aspect of Dial 9, please don't hesitate to get in touch.